For some people, dessert is the best meal of the day. With so many options to choose from, it's sometimes difficult to decide what dessert to make. However, one thing we can all agree on is that the easier the dessert is to make, the better. This free eCookbook, 18 Easy Recipes for Dessert, has so many great dessert recipes that you won't know where to begin. Best of all, you can spend very little time preparing them and more time enjoying them. Whether you're craving something chocolatey or something fruity, you'll find a recipe (or two) in 18 Easy Recipes for Dessert that you'll want to make immediately. The first chapter is all about cake. Though they may be easy to make, they're definitely not your average cake recipes. With names that end in "mud cake," "dump cake," and "crumb cake," you can expect to be licking your plate clean in no time. Chapter Two has three easy brownie recipes. 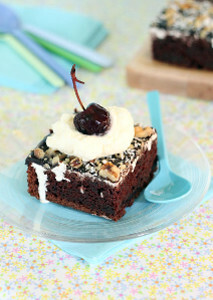 Each of these recipes take traditional chocolate brownie recipes and add a little something extra to make them amazing. The third chapter is easily the largest chapter in the book, and for good reason. 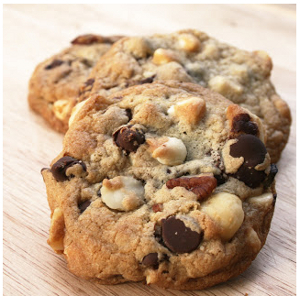 Starting on page 12, you'll find a wide variety of easy cookie recipes to try. Chapter Four focuses on delicious dessert bar recipes. You won't believe how many great flavors can be packed into a simple dessert bar form. The final chapter has, quite possibly, the easiest dessert recipes of all: no bake desserts. We made sure to throw in two different Rice Krispie treat recipes because we know how much of a fan favorite they are. No matter what you're craving, you'll find a ton of great dessert recipes in this eCookbook. Download your free copy of 18 Easy Recipes for Dessert today! I want a free copy of the 18 Easy Recipes for Dessert eCookbook! Chapter one of 18 Easy Recipes for Dessert has three cake recipes that are perfect for every occasion. If you're looking to make a cake completely from scratch, you'll definitely want to check out the recipe for Down-Home Mississippi Mud Cake (p. 6, pictured). Cocoa and espresso powder make the cake as chocolatey as can be. The cake is then covered with an assortment of toppings, including marshmallow fluff and nuts. However, for those of you who want their cake recipes to be impossibly easy, the other two cakes are made with cake mix. Even though you're cutting out the process of actually making cake batter from scratch, you're in no way cutting out any flavor. You can check out these three easy cake recipes by downloading your free copy of 18 Easy Recipes for Dessert. Download your free copy of the 18 Easy Recipes for Dessert eCookbook today! Even though it's really easy and hassle-free to make brownies with brownie mix, you can sometimes miss out on the opportunity of personalizing your dessert and making it as tasty as possible. That's where the brownie recipes in Chapter Two of 18 Easy Recipes for Dessert come in. 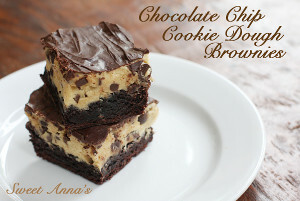 The first two brownie recipes, Chocolate Chip Cookie Dough Brownies (p. 9, pictured) and Unforgettable S'mores Brownies (p.10) are made completely from scratch. These sound complicated, but are actually pretty easy to make and would be great for parties or large gatherings. You just might have to double the batches because once people try them, they won't be able to get enough. The last brownie recipe in this chapter does involve brownie mix, but the recipe does not stop there. To find out what makes these boxed brownies so delicious, download your free copy of 18 Easy Recipes for Dessert and turn to page 11! We made a point of including a few dessert bar recipes in 18 Easy Recipes for Dessert because we think the dessert bar is underrated. The three recipes in this fourth chapter of our eCookbook show that full-bodied flavor can come in small packages. You'll love how the Cherry Crumble Bars (p. 17) taste just as good (if not better) than a slice of cherry pie. Their fruit layer makes them sweet while the crumble layer adds a bit of warm cinnamon flavor. They taste the best during the summer when cherries are in season, but make for a great dessert all year round. The other two dessert bars are a bit denser than the crumble bars but are just as easy to make. 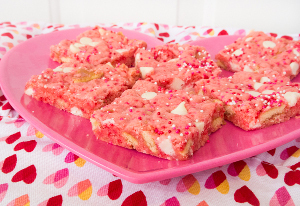 The pink hue of the Strawberry Sweetheart Bars on page 18 (pictured) make them the perfect treat for your special someone on Valentine's Day, while the frosting on the Frosted Sugar Cookie Bars (p. 19) can be customized for holidays and special occasions. 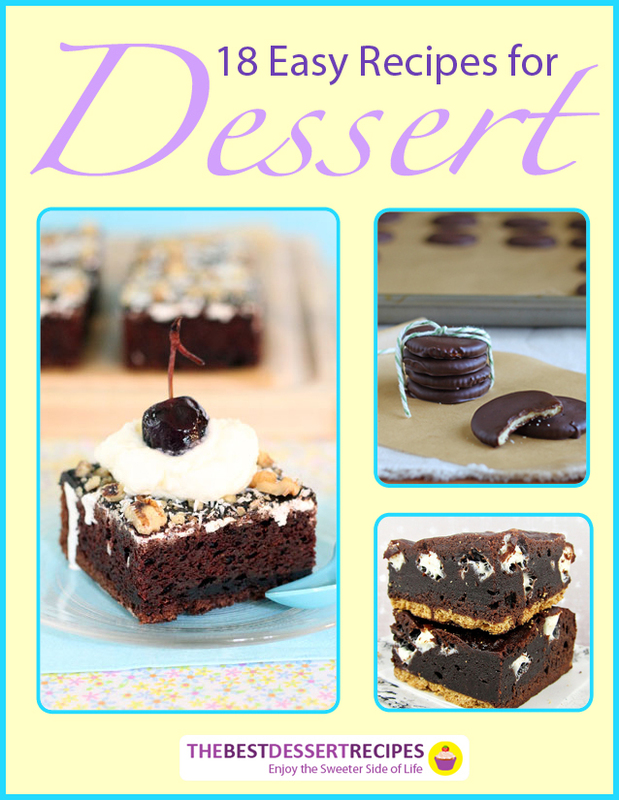 Make sure to download your free copy of the 18 Easy Recipes for Dessert eCookbook so that you can make these easy dessert bar recipes right away. The fifth and final chapter of 18 Easy Recipes for Dessert includes a bunch of easy no bake recipes. No bake desserts are great for those days when you just don't feel like turning on the oven or heating up the house. Because you don't have to do any baking at all for them, no bake recipes are generally the easiest of all desserts. 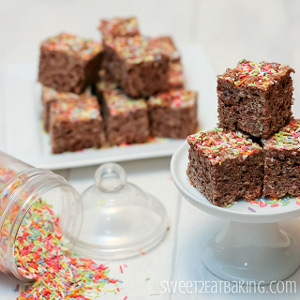 Two of the four recipes in this chapter are for flavored Rice Krispie treats, like Chocolate Funfetti Cake Batter Rice Krispie Treats (p. 23, pictured). While you may have made or eaten regular Rice Krispie treats before, you've never tried any like these. You'll also see a recipe for Chocolate Chip Cookie Dough Fudge (p. 21) that taste just like the dough you'd use to make cookies. Spend less time in the kitchen preparing and more time enjoying your dessert with these super easy no bake recipes. Download your free copy of 18 Easy Recipes for Dessert to see the recipes in their entirety. Weekly emails with dessert recipes, tips, collection pages and more. This sneak peek of what this new eCookbook has in store for you has hopefully convinced you to download it free today. If any or all of these recipes appeal to you, click on one of the eCookbook icons anywhere on this page to download your free copy of 18 Easy Recipes for Dessert. You won't regret downloading this free eCookbook and printing its delicious recipes! Once you get your copy, you can either keep it on your computer or eReader, or print it out and keep it in your kitchen. No matter how you use your eCookbook, once you've tried even one of the recipes, you'll be glad you downloaded it. For someone who doesn't always have a lot of time to bake, these dessert recipes are perfect for me! I haven't made them yet but they all look delicious! The recipes looks easy enough also. Except for the fact that these cookies call for biscotti or something that I have never heard of.